The Wayback Machine Chrome browser extension helps make the web more reliable by detecting dead web pages and offering to replay archived versions of them. You can get it here. 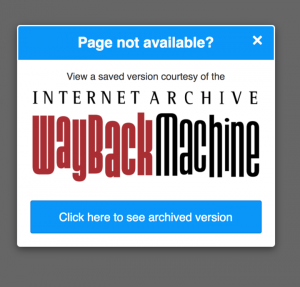 For the past 20 years, the Internet Archive has recorded and preserved web pages, and hundreds of billions of them are available via the Wayback Machine. This is good because we are learning the web is fragile and ephemeral. For example a 2013 Harvard study found that 49% of the URLs referenced in U.S. Supreme Court decisions are now dead. Those decisions affect everyone in the U.S., and the evidence the opinions are based on is disappearing. When previously valid URLs don’t respond, but instead return a result code of 404, we call that link rot. The Wayback Machine Chrome extension is designed to help mitigate against link rot and other common web breakdowns. The Internet Archive considers the privacy of our users to be of critical importance. We try not to record IP addresses, and we have fought National Security letters. You can rest assured that the use of the Wayback Machine Chrome extension will not expose your browsing history. In addition we are in conversation with Google about adding a proxy server as an additional layer of protection. Thank you for giving the Wayback Machine for Chrome extension a try. You can test it with this URL: http://www.pfaw.org:80/attacks.htm We are committed to supporting better web browsing experiences and welcome your feedback and suggestions about how we can improve. Please send us your bug reports, feature requests and other feedback directly to info@archive.org. Please note that feature requests, bug reports, general feedback is always appreciated. Great to see this for Chrome! I tried to use the extension on two different machines, and different Chrome channels, but it is not working at all. The test URL provided shows no notification to open the page using the Wayback Machine. Hi… can you please email info@archive.org so we can help you make this work? Thank for giving us the opportunity to help you! The test URL was munged by the Google Play Store. Several users complained. Very cool! Where do I submit feature request? That’s great! Where can we find the sources of this chrome extension? Whenever an extension requires read/write on all the content I view, I prefer to fork it myself. Why does the new version require permission to “read and change all data” ? It would be great if this extension didn’t continuously log message to the console. It’s getting annoying seeing the pointless “Message received” messages so often when trying to use devtools. Other than that, seems really nice!